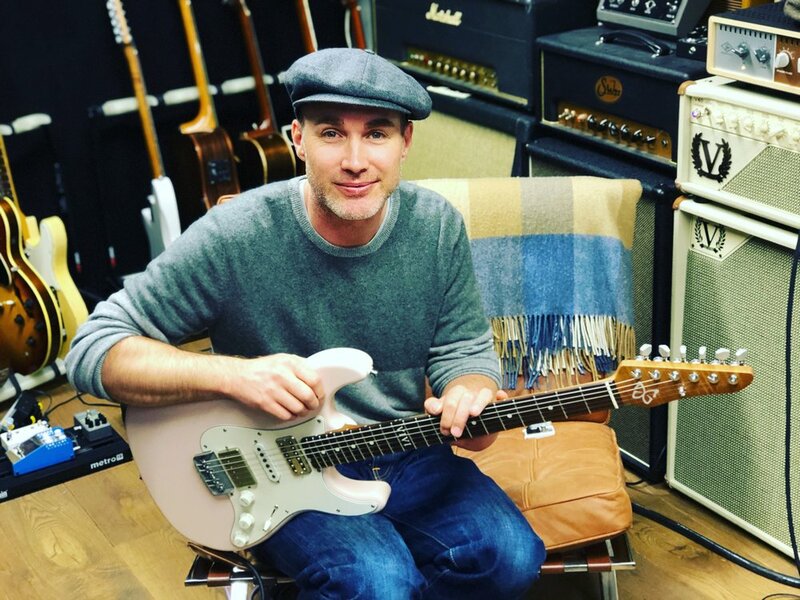 Justin in his filming/recording studio with his Shell Pink Emperor model - featuring RadioShop Pickups, a Mastery bridge and a 1/4 sawn, roasted Maple neck. Justin needs no introduction to anyone who has needed expert guitar lessons delivered with style and taste on YouTube. Justin’s huge subscribing audience of devoted learners are treated to free lessons covering everything from their first chords all the way to complex Jazz soloing techniques. Justin approached me to make him a very specific guitar featuring a very interesting selection of pickups, bridge, colour and finish. As you can see in the picture above, Justin went for humbucker, single coil and Filtertron style pickups, all wound by Radioshop Pickups, based in Wales. An Alder body was also chosen to accompany the 1/4 sawn, flamed, Maple neck and Pau Ferro fingerboard. A fixed, Mastery bridge keeps everything tight and resonant. Even the nitrocellulose clear coats have a matt finish, helping to reduce the glare from the studio lights that Justin is so used to being surrounded by. The custom ‘VIVI’ inlay on the 12th fret is actually Justin’s nickname for his daughter, the numerals do add up to 12 too! I’ll let Justin himself talk and play you through the guitar in this excellent video…..